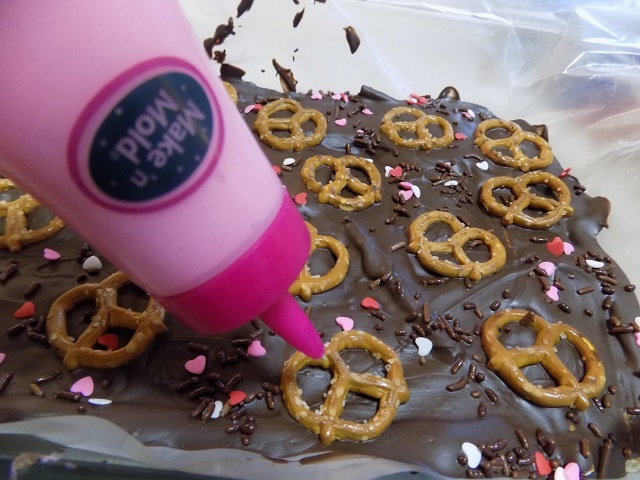 One Savvy Mom ™ | NYC Area Mom Blog: Gluten Free Chocolate Covered Pretzel Bark Tutorial - Great DIY Treat For Valentine's Day! 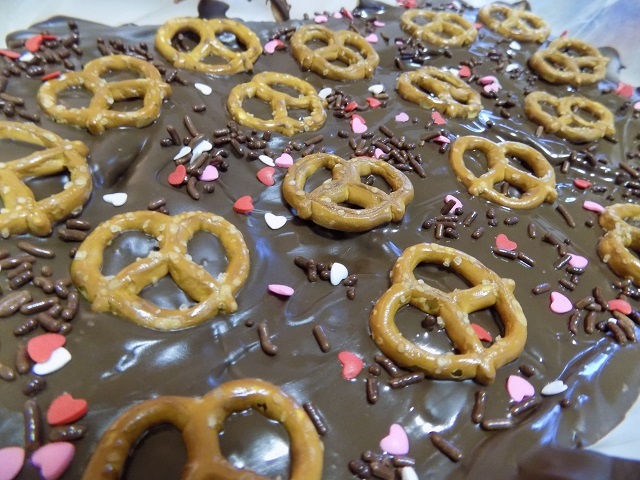 Gluten Free Chocolate Covered Pretzel Bark Tutorial - Great DIY Treat For Valentine's Day! This DIY Chocolate Covered Pretzel Bark is the perfect gluten-free sweet treat for Valentine's Day! 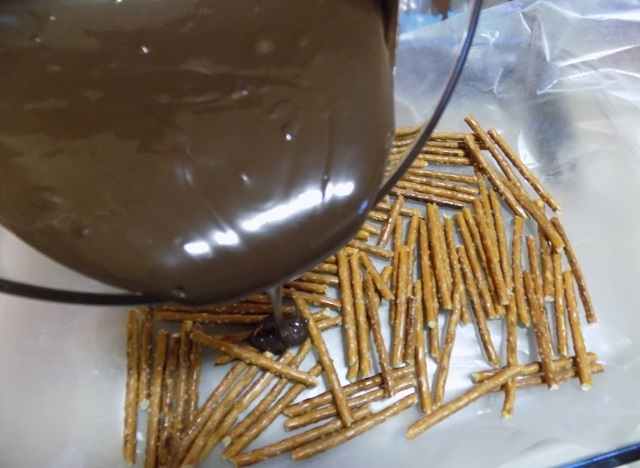 We made our chocolate covered pretzel bark with gluten free pretzel sticks and and gluten free pretzel twists, however you could easily swap out with regular pretzels if you'd like! When you fill in the mini-pretzel twists with pink chocolate (or white or even red) - they look just like chocolate hearts. So cute! Friends, I wasn't originally planning on posting this. But when I started making it for the kids, I realized how fun it would be to share here for a little Valentine's day DIY gift / treat inspiration. So please forgive the imagery, as it was totally impromptu! Grab the simple supply list and instructions on how to make our Gluten-Free Chocolate Covered Pretzel Bark, below. It's the perfect sweet treat for sharing and enjoying with the one's you love, this Valentine's Day! Bottle or piping bag with fine tip (to fill in the center of the pretzel twists with pink/white/red chocolate). I used a small bottle made by Make N' Mold - found in the craft section at most craft stores. Next, spread your gluten-free mini pretzel sticks (evenly in a single layer) on the bottom of your lined baking dish. Now, pour your melted milk chocolate (evenly) over top of the mini gluten free pretzel sticks. Make sure to cover the mini pretzel sticks and the entire base of the dish completely and evenly. While the milk chocolate is still wet / hasn't set, set your mini gluten free pretzel twists just on the surface (don't push/press them/submerge them in the chocolate - you want the outline of the mini gluten free pretzel twists to be completely visible). Allow milk chocolate to dry/set for 10-15 minutes. Once the chocolate has cooled/set, melt down your colored candy / chocolate to fill in mini pretzel twists (refer to images above and below ). Add it to a piping bag with a fine tip OR if you're using a bottle like the one I used (pictured) you can melt the candy in the bottle, using a microwave (refer to instructions on the packaging of the bottle). Pipe your colored chocolate into the center of each of the mini gluten-free pretzel twists, to make them look like hearts (refer to images above and below). Allow chocolate/candy to cool completely/ set for 20-25 minutes. Once your chocolate covered pretzel bark has cooled completely, break it apart (this step is best done carefully with a knife) into 3"-4" pieces. 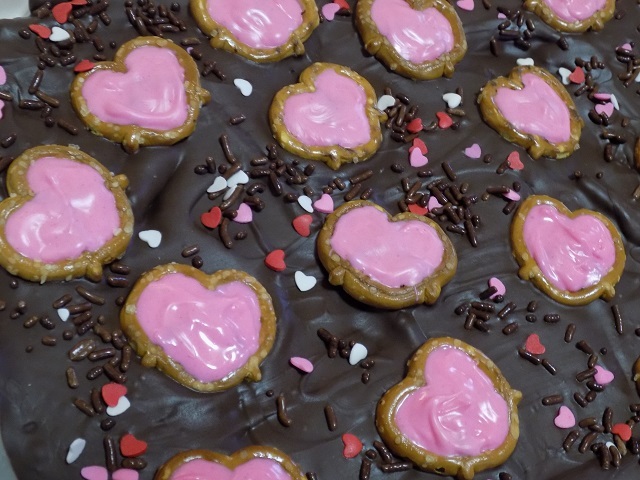 NOTE: Be sure to break/cut your chocolate covered pretzel bark in a way that leaves the candy/chocolate filled mini pretzel twists hearts, in-tact . Serve immediately / store in an air tight plastic container for 5-10 days. I know just the person who would love to have me make these for him!